A short mountain bike trail of 6.5 km (13 km round trip) and moderate degree of difficulty can also be accessed east of the Kingscote Access Point. Once on the mountain bike trail, there is an interesting 150-metre side trail that provides access to Gut Rapids, which is a narrow scenic canyon on the York River. 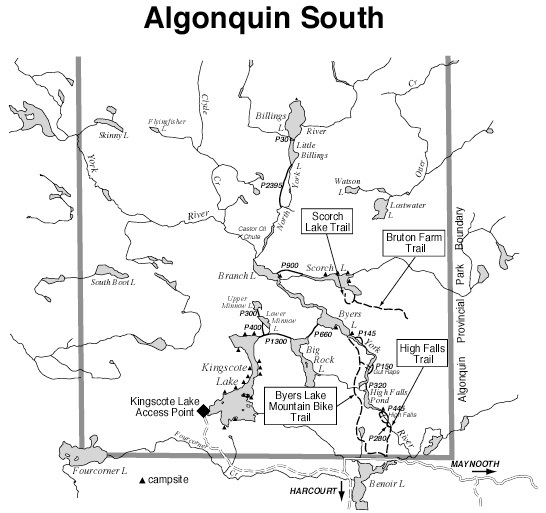 The trailhead is located about 10 km east from the Kingscote Access Point on the Elephant Lake Road north of Harcourt, Ontario. The Byers Lake Mountain Bike Trail is open from spring to fall. Moderate. Numerous steep grades and descents, rocks, roots, obstacles and muddy sections.